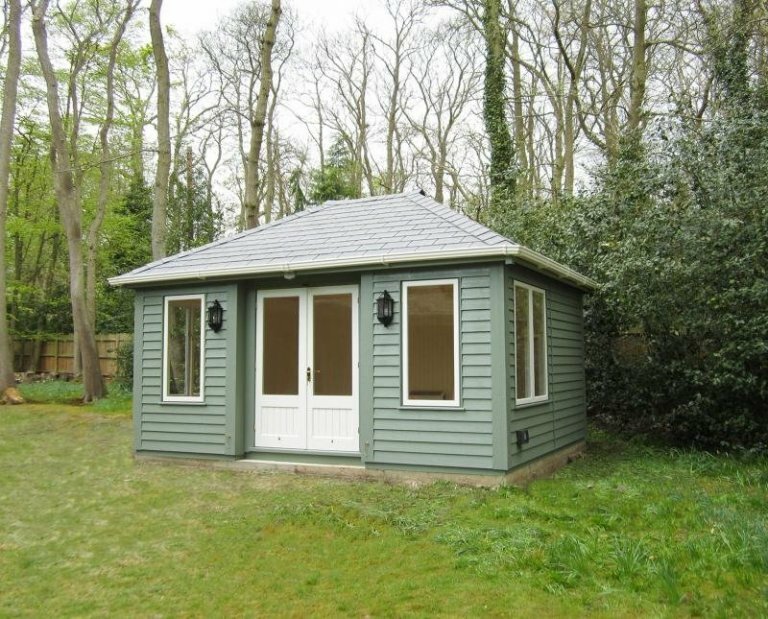 This Garden Room is 3.6 x 4.8m in size, and it has been installed in our customer’s woodland surrounded garden in Welwyn, Hertfordshire to use as a year-round use gym. 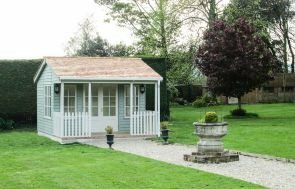 Our range of Garden Rooms are perfectly suited for using all through the year, as they are equipped with an electric pack, including a wall-mounted heater, full insulation, matchboard lining, double glazed windows, and draught excluders in the doors and windows. As well as these highly practical features, the external features have been chosen with care too, with grey slate effect tiles on the roof to match the roof of the customer’s house, white guttering has been chosen to frame the roof, and the cladding is our more rustic weatherboarding to suit their garden. 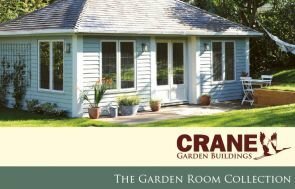 Inset doors and cornerboards give a homely feel to the building, and the Garden Room has been finished off in two different paint colours from the Farrow & Ball Paint Range: Card Room Green for the walls, and Wimborne White for the doors and windows. The final feature the customer wanted to ensure their building would be suited for its purpose was a heavy duty floor to cope with the weight of the exercise machines. 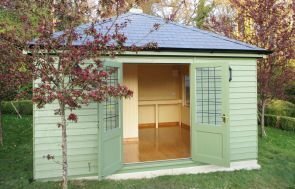 If you like the look of this Garden Room, whether you want one to use as an office, a hobby room or garden retreat, please call us on 01760 444229 to discuss your requirements with us, and we’ll be more than happy to help.